Monitor Risers are simply a platform that a monitor can be placed on which allows the user to adjust the height of their monitor according to what is ergonomic for them. Some use it to refer to an LCD Arm (which ErgoPedia considers to be a distinct product category) which allows ongoing adjustments of monitor height as required throughout the workday. What are the Ergonomic Benefits of a Monitor Riser? Monitor Risers allow the user to adjust the height of their monitor to the optimal position which is with the top of viewing surface of the monitor at or below eye level. Many risers are also hollow, and provide some ability to store paperwork, envelopes, or other materials, assuming the area is convenient and easily accessed. What are Potential Concerns when Considering a Monitor Riser? Monitor risers typically are an economical solution and by design can only provide a one time, 'set it and leave it' height adjustment. They also will take up a space on the desktop which could be used for other items; LCD Arms do not suffer from this drawback as they 'float' over the work surface. For what Types of Tasks / Users are Monitor Risers Suitable? Monitor risers are well suited to users who require a one-time height adjustment in their monitor and have no need to reposition the monitor in any direction. What Physical Injuries or Conditions Typically Benefit from a Monitor Riser? 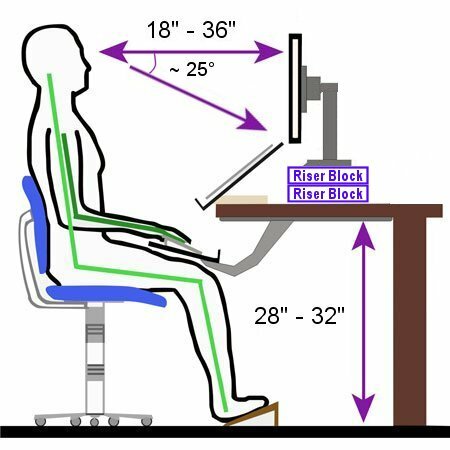 Individuals who have pain in their neck, shoulders and lower back from 'hunching' to view a monitor will benefit from a monitor riser.